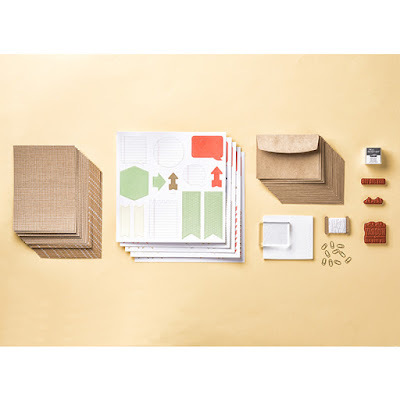 I have used the Party with Cake Bundle (page 7 of the Occasions Catalog) for the larger card, which is C6 size (appx 11 x 15 cm). I have cut the dies out with the Big Shot & Precision Plate. 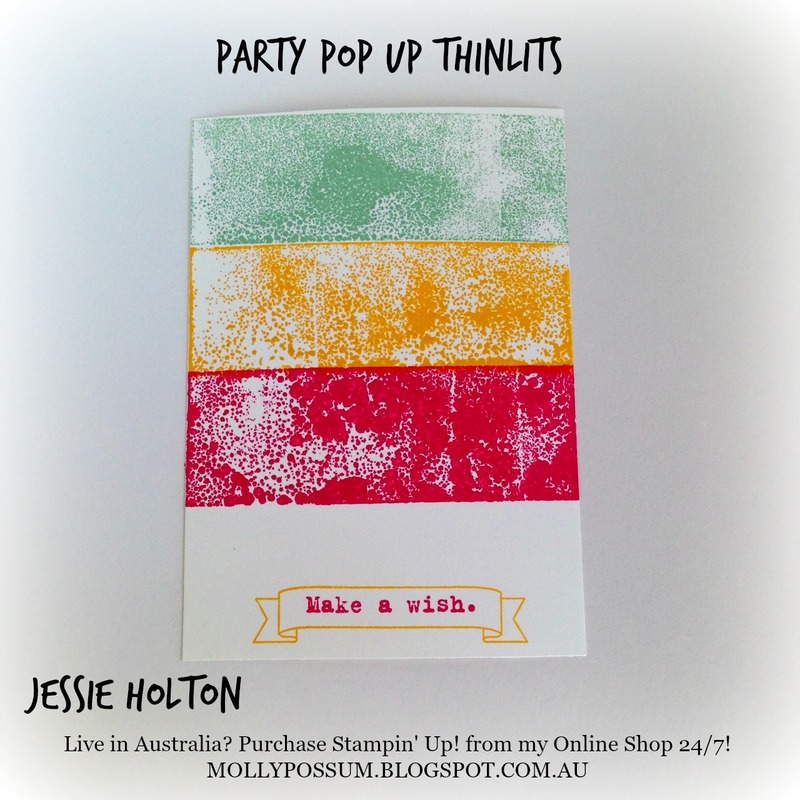 For the smaller card, I have used the Hostess stamp set Silhouettes & Script. The card measures 9.5 x 9.5 cm. 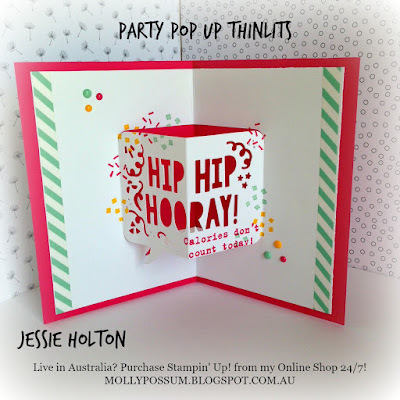 I have used the 2-1/2" Circle Punch to cut out the party hat & propped it up on Dimensionals. 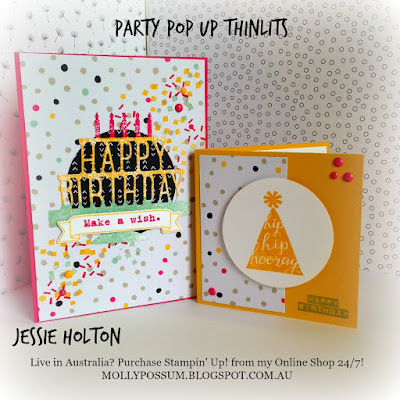 For both cards, I have used a bunch of products from the It's My Party Range, including the Designer Series Paper, Cardstock Pack, Designer Washi Tape & Enamel Dots. Other products I have used are Whisper White cardstock & Tombow glue. I have also used the coordinating inks in Melon Mambo, Mint Macaron & Crushed Curry. 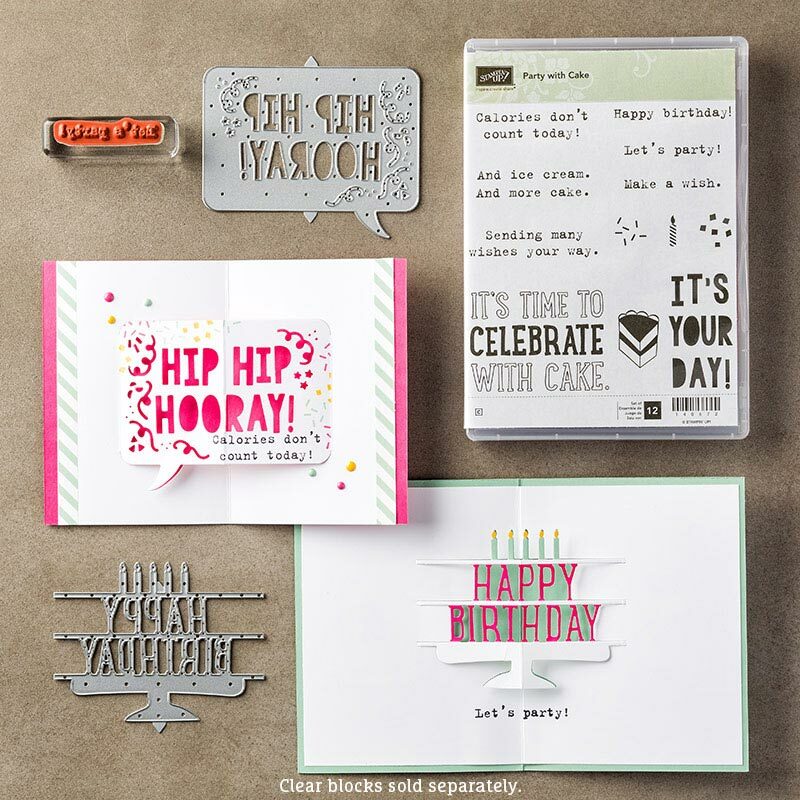 I have used the clear block stamping technique for the Happy Birthday sentiment on the front of the larger card. 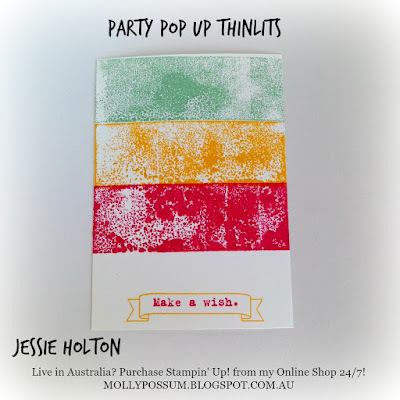 You just put the clear block straight onto the ink pad & then stamp it onto the cardstock to create this blotchy look. I have then run it through the Big Shot with the Precision Plate, using the Happy Birthday die from the Party with Cake Bundle. 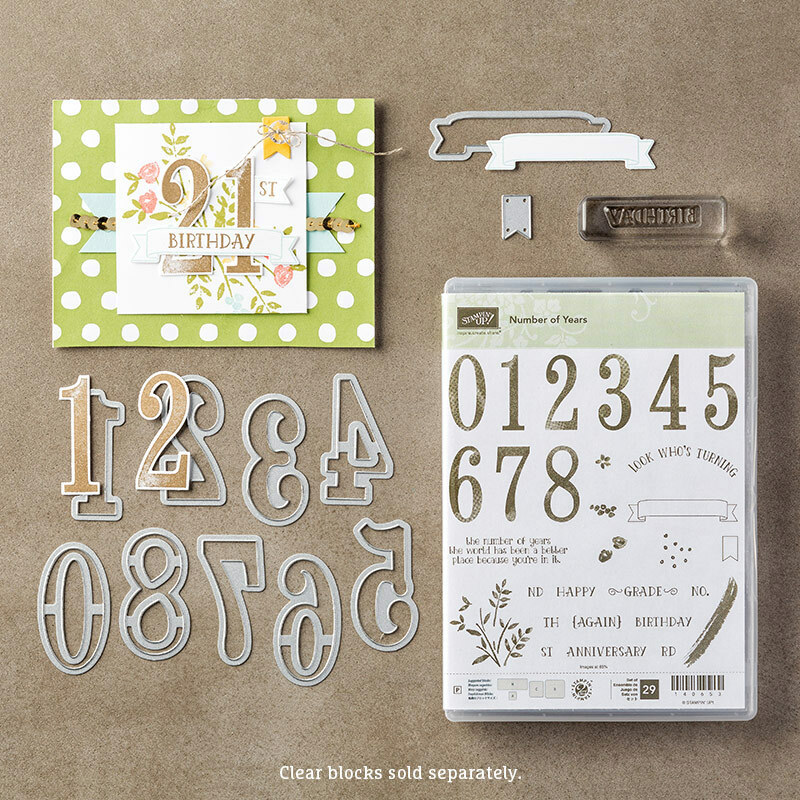 I have used the banner stamp & matching die from the Number of Years Bundle (page 10 of the Occasions Catalog) with the Make a Wish sentiment from the Party with Cake stamp set. I have used the Hip Hip Hooray die from the Party with Cake Bundle on the inside of the card & lined the outside edges with the Mint Macaron stripe Washi Tape from the It's My Party Designer Washi Tapes Pack. 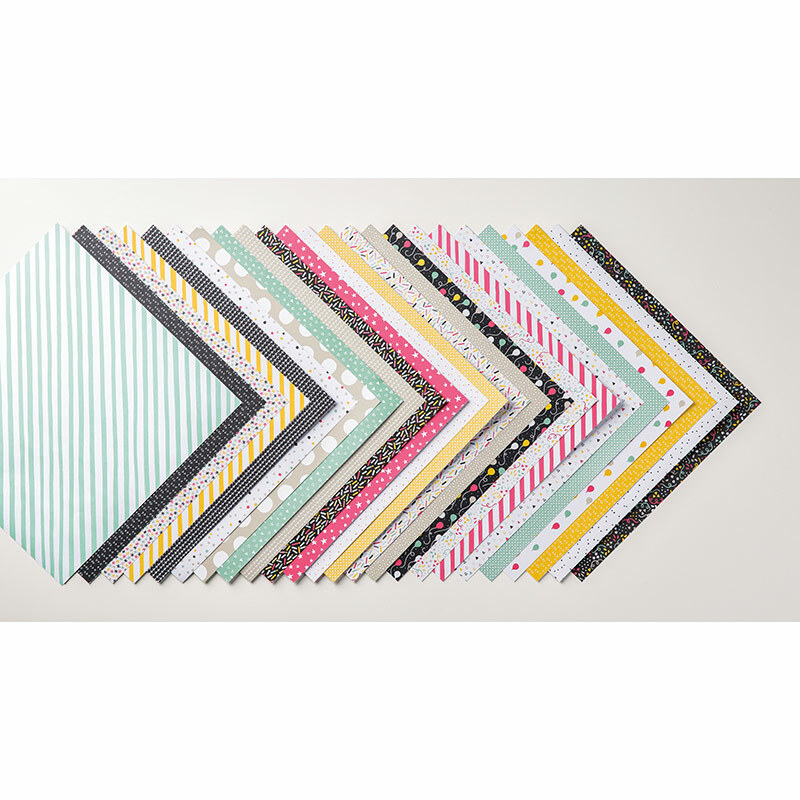 There are five really cool designs in the Washi Tape Pack. To get this pop up effect, you need to pre-score your cardstock & then line up the arrows on the die with the score lines in your cardstock. It is easier to stamp the cardstock before you fold it out, after putting it through the Big Shot. If you're a local to the Bellarine Peninsula & you'd like to have a party, please contact me & we'll set up a date & time for you. You can also enjoy all the great Hostess Rewards & fun games for yourself & your friends! Hanna also received a Hip Hip Hooray Card Making Kit as a little thank you gift from me for hosting her party. 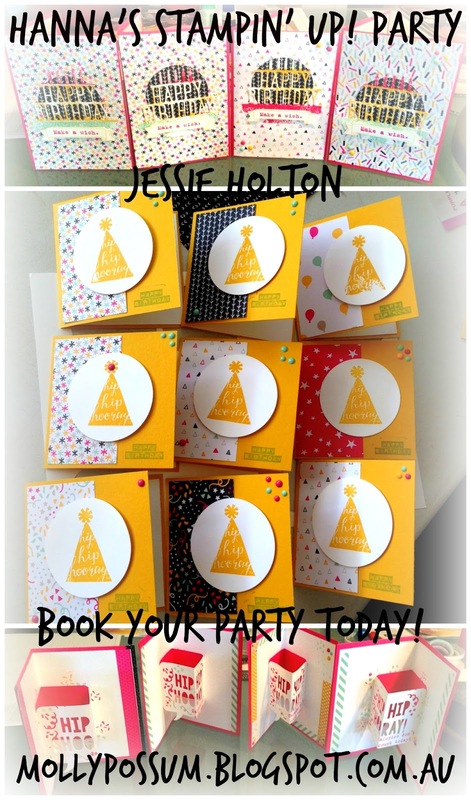 Book your party today & you can choose from a selection of stamp sets & card making kits as your thank you gift! 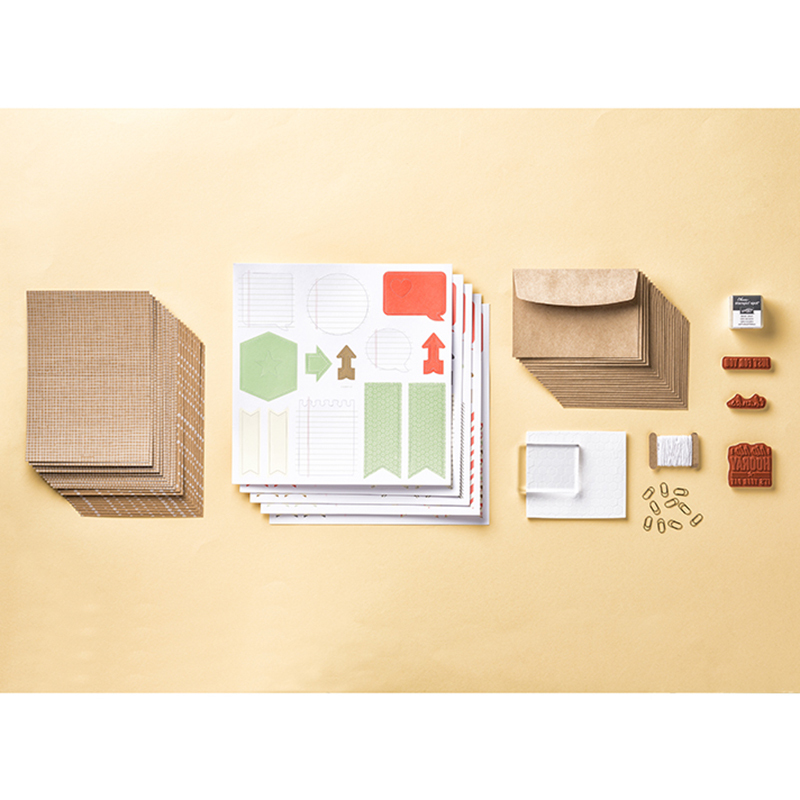 And on top of that, you'll also receive all of the Hostess Rewards that Stampin' Up! offer! Shoot me an email at mollypossum.c@gmail.com & we'll work out a date. Here are some of the products I have used for this project. 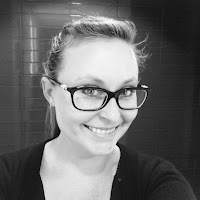 Click the link to go to my Online Shop!